Principles, implementation, application and benefits. What are Marine Energy Storage Systems? 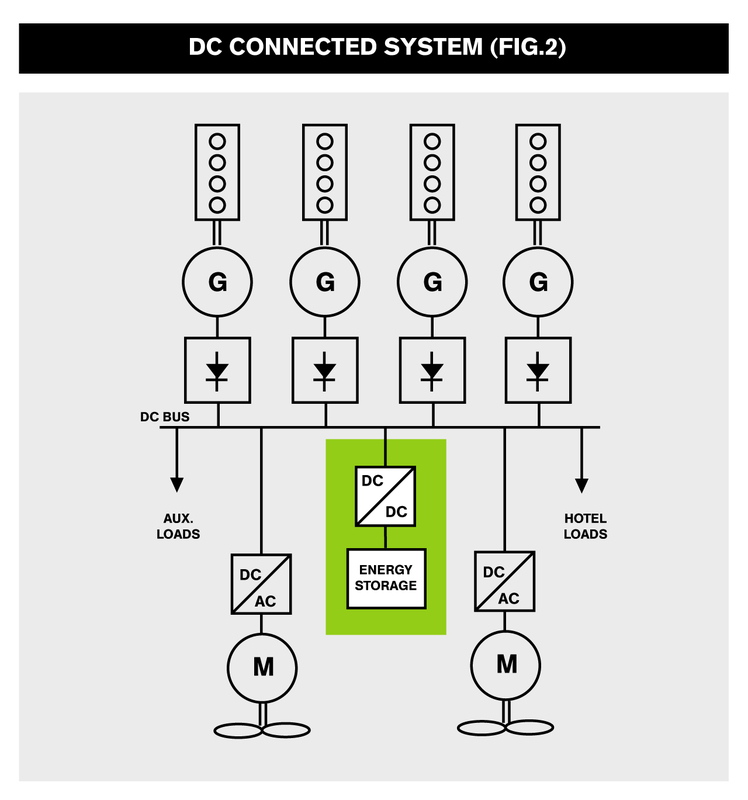 Energy storage can be connected to an existing conventional AC network by means of an AC/DC (+DC/DC) converter (Fig 1) or can be connected directly to a common DC grid, popular on modern vessels, using only a DC/DC converter (Fig 2). 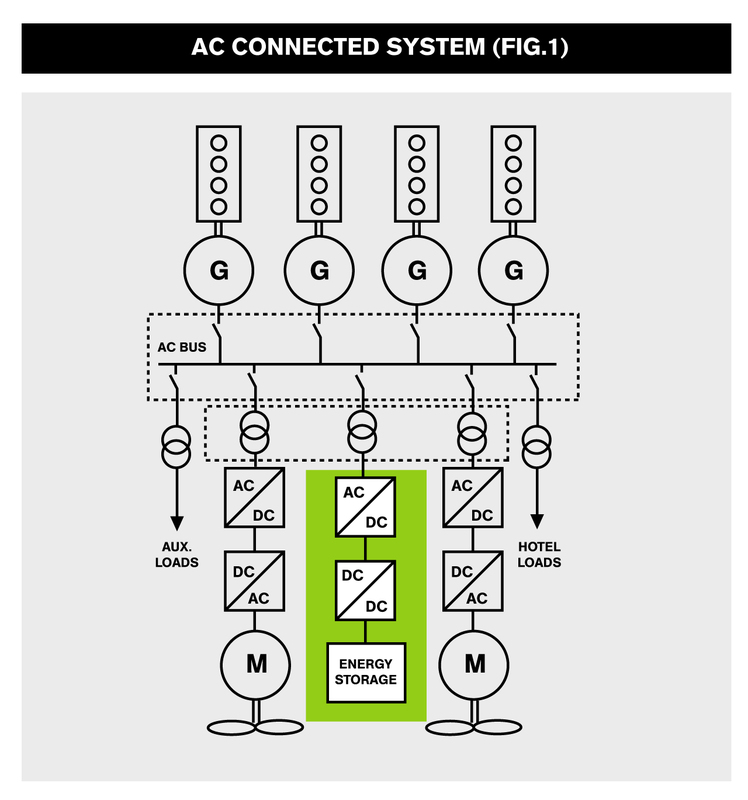 In AC connected systems the AC/DC static converter enables excess or spare energy from the AC network to be stored into batteries or capacitors and later released back into the AC network, without the use of rotating machinery such as motor-generator sets or flywheels. Energy Storage Systems are common in onshore electrical networks for grid support and in machinery such as ship to shore container handling and port cranes where they are used to dramatically reduce the overall power consumption by storing and releasing braking energy. They are widely used in traction applications such as trains, trams, buses and heavy construction plant and are now gaining widespread acceptance in hybrid vehicles and a host of other applications. Application in the marine sector is catching up and Energy Storage is now being applied in fields such as marine propulsion, active heave compensated winches and offshore cranes. How is Energy Storage relevant to Ships? 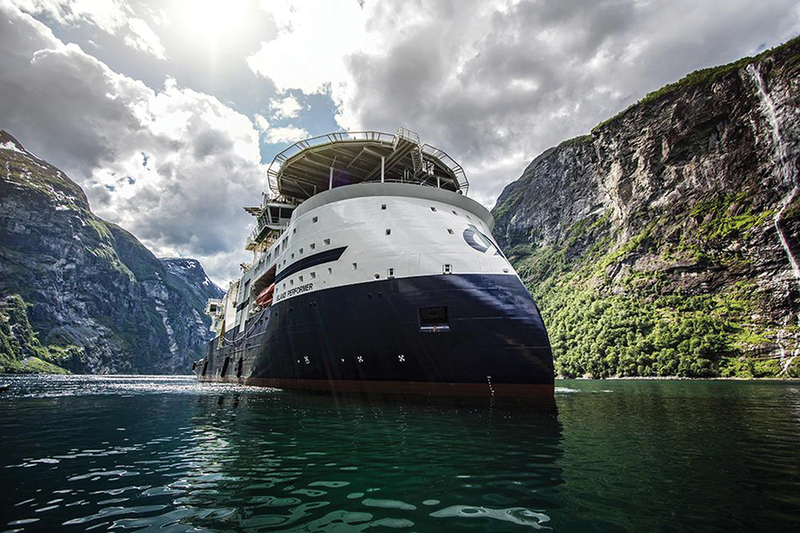 Ships are an ideal application for Energy Storage as they combine two of the most beneficial applications for energy storage, namely power generation/distribution and propulsion (traction). 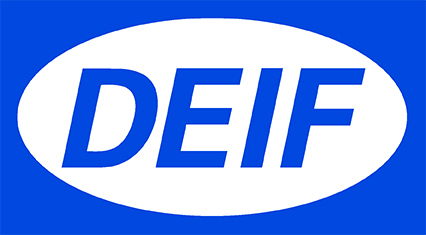 The diesel generator based ‘island’ power generation systems on board most ships coupled with cyclical load demand and safety and environmental considerations make Energy Storage the natural choice for increased safety, efficiency, lower emissions and reduced operating costs. 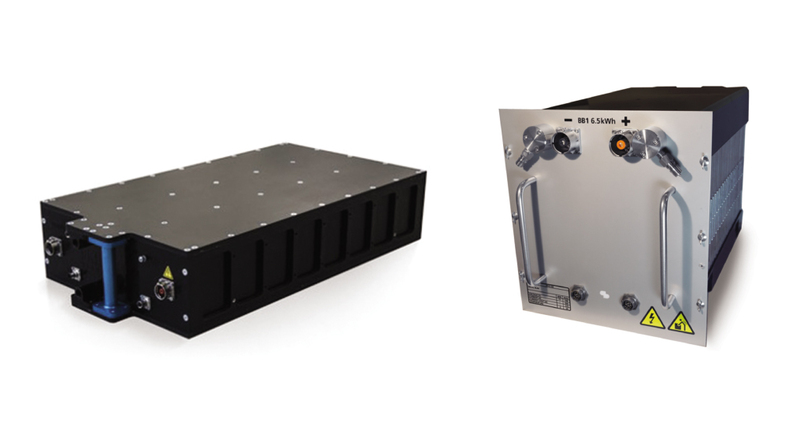 Both can be used for energy storage, but each is suited to different applications and load profiles. 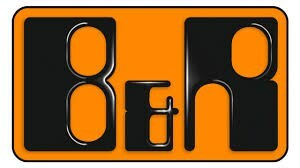 that they can supply very high power for a short period of time. Batteries on the other hand have high energy density and relatively low power density making them more suited to supplying lower levels of power over a longer period of time. Capacitors are more suitable for high and rapidly cycling loads, for example applications like active heave compensation or dynamic (regenerative braking) on buses. Batteries are more suited to lower more stable loads, for example propulsion, traction and UPS. Why do I need a DC/DC converter even on a DC connected system? In converter systems the DC bus voltage must be quite tightly controlled and if batteries or capacitors are directly connected without a DC/DC converter as they discharge and their voltage reduces, the minimum DC bus voltage is quite rapidly reached before much of the stored energy is used. The DC/DC converter enables the battery or capacitor voltage to reduce according to its normal discharge curve, whilst maintaining the main DC bus voltage at a constant level, allowing much more of the stored energy to be practically accessed. 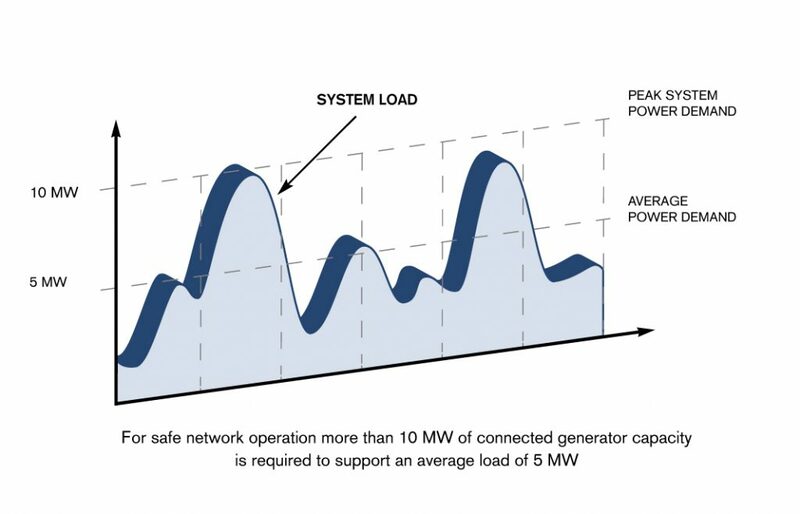 This is a term frequently used in the power generation industry to describe generator capacity that is connected to the network but that is not loaded or is very lightly loaded. 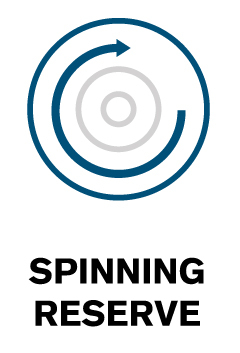 It is connected to provide redundancy and also in anticipation of a demand surge, in which case the Spinning Reserve can pick up the load instantly and prevent network outages. On a ship this often takes the form of running more generators than required to support the load, in order to provide redundancy in case a generator shuts down. This is commonly done on standby, whilst navigating in and out of port as a safety measure to protect against blackout due to generator failure. This normally results in the generators running very lightly loaded for extended periods of time which apart from increased fuel and running hours actually damages the engines due to low combustion pressures. Diesel engines perform most cleanly and efficiently at high continuous load, light loading for prolonged periods is undesirable. 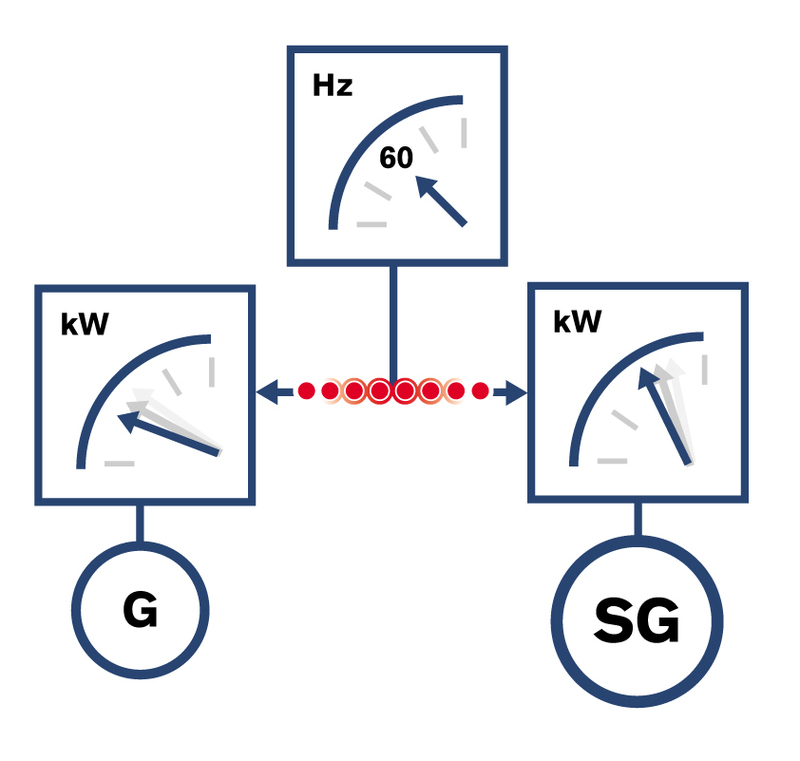 By using Energy Storage to provide ‘Engine-less’ Spinning Reserve the same amount of short time network resilience can be achieved without running excess generator capacity. This allows sufficient time for another generator to be started, synchronised and connected to replace the failed machine. Power generation efficiency is at its highest when the generator capacity connected to the network is closely matched to the load, particularly when the generators are diesel engine driven as discussed in the Spinning Reserve case. However, this is impractical as the load is continuously varying. Constant power operation is impossible to achieve with a highly cyclical load such as a Dynamically Positioned Vessel or where Heavy Consumers are frequently starting and stopping or loading and unloading for example Cranes, Winches, Compressors and Pumps. 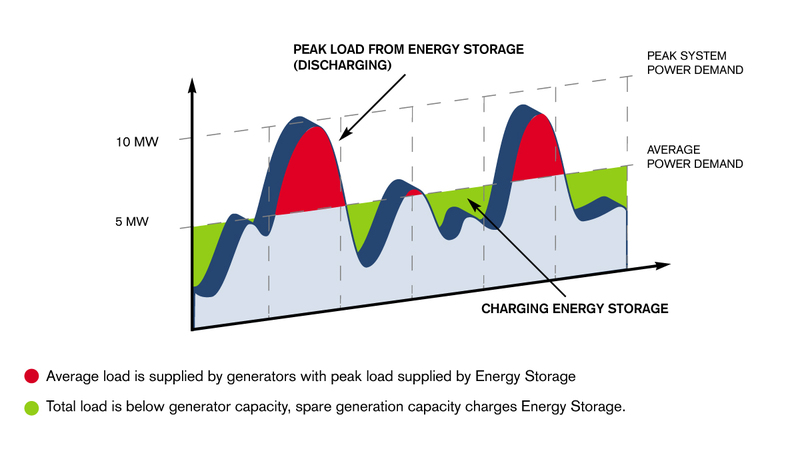 In these cases in order to be able to supply the peak loads in a conventional system, sufficient spare capacity or Spinning Reserve is required to be connected to the network. In many cases the average or RMS value of the load is far below the peak value, for example it is not uncommon for an average sized Diesel Electric Offshore Construction Vessel when operating in Dynamic Positioning Mode to have RMS electrical load values of half or even a third of the peak values. If these peaks can be ironed out by storing energy in the low part of the demand cycle and releasing it again in the high part of the demand cycle, the amount of Spinning Reserve can be dramatically reduced. This can be easily achieved using Energy Storage Systems in Peak Shaving or Load Levelling mode, another term commonly used in the power generation industry. 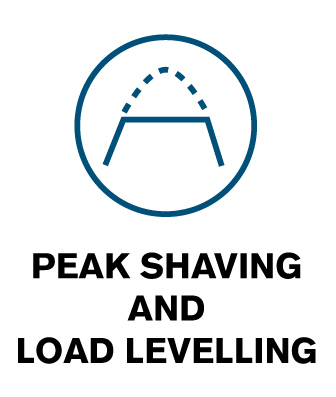 Peak Shaving or Load Levelling uses spare generator capacity during the low part of the cycle to charge the Energy Storage System which is subsequently released during the high demand part of the cycle. This effectively and safely shaves the peaks off the cycle and enables the generation capacity to be more closely matched to the demand enabling the connected generators to operate at high load factors and substantially constant power resulting in a dramatic increase in efficiency. 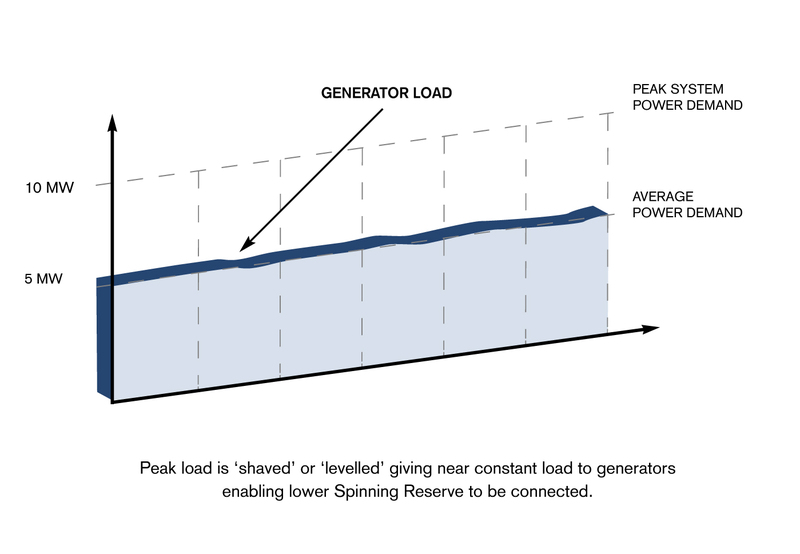 During peak shaving the connected generator capacity can be significantly reduced to match the average load whilst maintaining safe operation. Fuel, running hours, maintenance and emissions are all reduced. Small generator powered ‘island’ networks as found on ships can suffer from excessive voltage and frequency sags and surges as heavy loads are applied and removed due to the low rotating inertias of small generators and relatively slow transient responses of governors and automatic voltage regulators. Although class rules must be adhered to regarding network stability and the equipment connected to the network should be able to tolerate it, problems are frequently encountered particularly on vessels that have been converted or re-purposed. Energy Storage does not suffer from sluggish transient response as energy release and response is almost instantaneous. Energy Storage can be used effectively to ‘support’ the network (known as grid support in the power generation industry) significantly reducing or eliminating sags and surges. 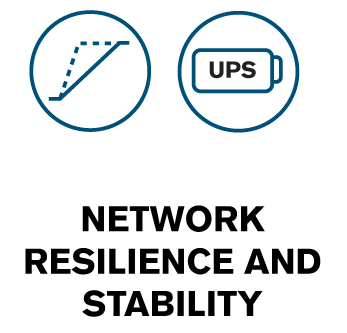 The system can also be used as a parallel connected UPS and can be used to maintain transitional power to the network in the event of generator failure. Transferring load between Shaft Generators and Auxiliary Generators in rough weather can be hazardous and in some cases not possible if propeller shaft speed variation is excessive. In these cases the vessel often remains on Auxiliary Generators for safety with the resulting loss of efficiency and increase running hours. Due to its fast response the Energy Storage System can provide an effective method to enable safe transfer between Shaft Generators and Auxiliaries by acting as a transitional dynamic ‘island’ that can be synchronised to an unstable supply. 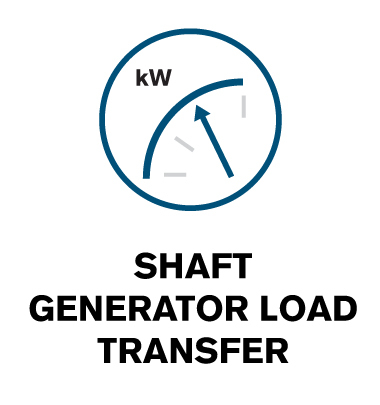 The shaft generator can be first synchronised to the Energy Storage System and the load transferred. The Energy Storage System then carries the load for a short time and provides a stable source to synchronise the Auxiliary Generators to. Energy Storage can therefore improve safety, enhance operational flexibility and reduce running costs. Whilst in port ships often run generators at partial load, which as discussed previously, is inefficient, costly and not environmentally friendly. 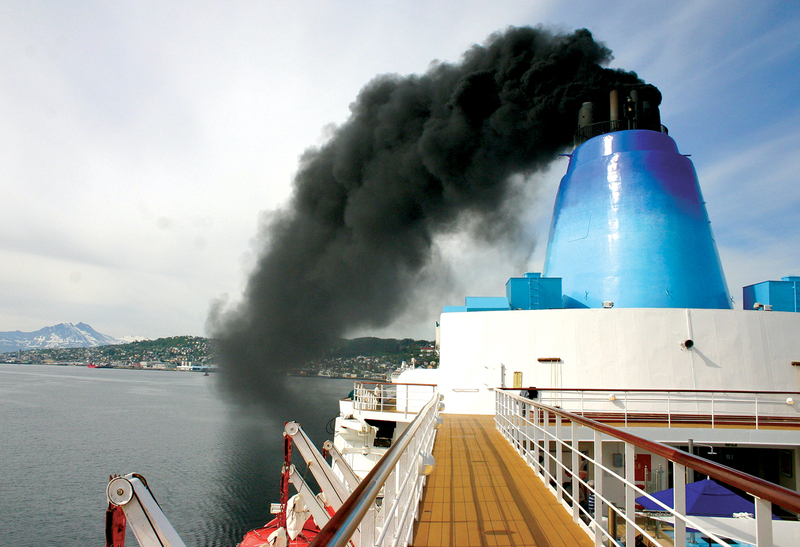 Many ports, are in fact moving towards preventing ships using diesel generators whilst alongside and making shore power connections mandatory. This is especially important in close proximity to residential developments where noise pollution and particulate emissions can also be a significant factor. 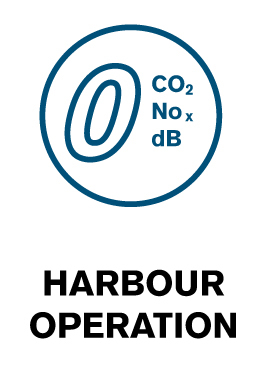 Rather than running diesel generators at partial load continuously, Energy Storage Systems can be used to power the complete vessel load whilst in port, with diesel generators running only periodically and at full load to recharge the Energy Storage as required. This results in a significant reduction in running hours for the generators and when they do run, they are running close to full load so operating at their highest efficiency and cleanliness, reducing CO2, SOx and NOx emissions. What are the Benefits of Marine Energy Storage? 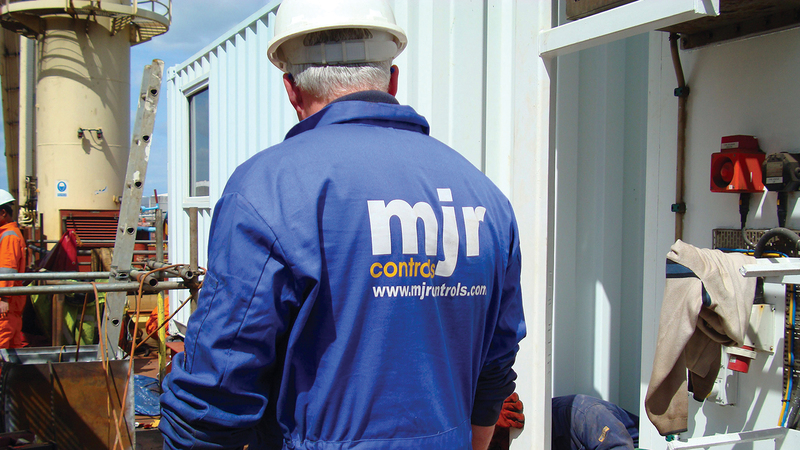 From workboats to commercial vessels, whether a retrofit containerised solution or integrated into a newbuild vessel, MJR is your No. 1 partner of choice for Marine Energy Storage.